Real Life Retail Dispute – Do temporary vendor booths impede the rights of a recorded easement? Here is a very interested real-life dispute that KW CRECO recently encountered. Yes, the case is resolved, but what was the prevailing legal interpretation that forced a resolution? Which party would have prevailed in court? "TOGETHER with the perpetual right of ingress and egress over the 10-foot strip of land on the Western side of Lot 2-B." Consolidated Amusement bought Pacific’s lot and operated a movie theater there since 1934. Jupiter Business Plaza ("JBP") acquired title to an adjacent lot and planned to construct the Plaza Building and set up vendors’ booths in the area. Before the merchants began operations and during construction of the Plaza Building, both parties agreed to allow a "pedestrian passageway" for Plaza activities when the plaza commenced commercial business with various booths. Consolidated maintains the booths interfere with its easement for theater patrons. JBP claims that a small passageway is sufficient. Who is correct? 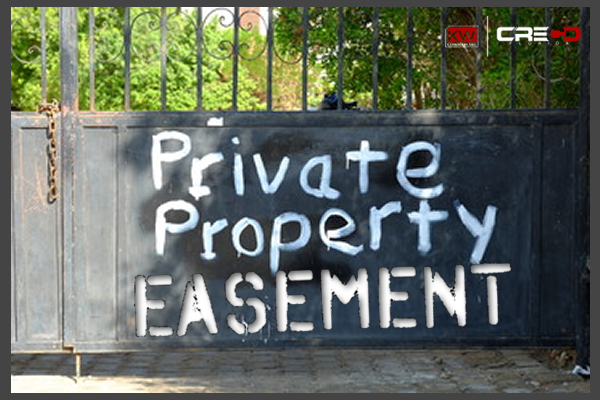 Can a written agreement reduce the easement? In this easement related dispute, Consolidated Amusement (“CA”) is the owner of the dominant estate, and Jupiter Business Plaza (“JBP”) is the owner of the servient estate. The question arises as to whether an owner of the servient tenement can erect and maintain structures on a portion of an easement so long as the originally intended use of the easement (in this case ingress and egress) is preserved. The matter is further complicated by the distinct and definite terms which are outlined in the recorded easement. The new impediment on the easement created by JPB in no way conflicts with the identified intended use of the right of way but represents a clear encroachment on the defined location of the easement. This case presents a compelling factual basis because the parties are disputing prevailing interpretations of the same easement. Neither party is challenging the proper recordation, defined terms, or validity of the easement nor is the fact that vendor booths are within the designated easement. Which aspect of the easement is most critical to preserve – location or purpose? Since the 10-foot right of way over the easement was legitimately granted to CA’s predecessor and because the easement specifies the width, length, and location of the easement in the recorded documents, JBP had no legal right to reduce the width of the easement. Theoretically, JBP may contend that as the owner of the servient tenement, it is legally entitled to maximize the use of its property so long as its actions do not interfere with ingress or egress to CA’s property. Additional questions may arise as to whether vendor booths are considered permanent fixtures to the property or whether temporary booths qualify as unreasonable interference. Still, without consent from CA, the placement of permanent or temporary structures within the defined boundaries of the easement should not be permitted. JBP may utilize the argument that a prolonged installation of a mutually agreed upon “pedestrian passageway” may supersede the defined physical area of the easement. However, can JBP uphold the argument that this mutual consent represented more than a temporary agreement between parties? To do so, JBP would have to prove that the one-time allowance of a pedestrian pathway established a partial abandonment of the easement, which would significantly diminish the use of the easement area as a means of ingress and egress. What if CA temporarily allowed a pedestrian pathway before the expansion of its building or business model with the reliance on a future reversion to the defined easement? A realistic application of this argument would still indicate that any historical consent to a pedestrian pathway in no way permanently alters the defined terms of a recorded easement. If JBP had intentions on installing a permanent impediment to the right of way, why would it not have negotiated for a recorded modification to the easement? Since the easement was granted to CA’s predecessor in a manner which specifically and definitely set forth the width, length, and location of the right of way, JBP had no legal right to diminish the size of the easement by any obstruction, regardless of whether or not the intended use was preserved. It was this legal interpretation that pressured JPB to remove the vendor booths and provide CA with full, unlimited use of its easement.